Raise your hand if you aren't scared of height! Well... I thought so, who isn't, right? What if I asked you to take a step beyond the edge of a cliff, will you? Well... sometimes you have to take that leap of faith and take that final step or should I say the first step beyond visible ground trusting the ropes around your waist and those people on the cliff and at the base, whom you have never met before, and probably will never meet again. When my hubby suggested we go for rappelling from Duke's nose near Lonavala, I felt my legs trembling while seating on a couch and I broke into a sweat (though it was the month of December, peak of winter). I am scared of height and who isn't? It is one thing to watch the videos of people doing all sorts of adventures at heights (including hiking, rock climbing, rappelling, and even tightrope juggling) and marvel, but it is totally different thing to stand on top of a 350 ft cliff with your back towards a valley, move with nothing under your feet, when you can't even see where you are headed. It all started with a trek up the cliff. The sun was shining bright and there was limited amount of water available on the top of the cliff. With a large amount of crowd, we had to wait for a couple of hours for our turn. By the time, my turn came, I was hungry, thirsty, scared and desperate to get down to a comfortable place to sit. I was all smiling, cheering for all those going before me. When it was my turn, my smile changed instantaneously as I crossed those barriers. The organising team was giving me instructions and I was cursing myself for signing up for this. I could have been sitting on a comfortable couch, watching my favourite movie, hogging on some delicious meal right now. What made me opt for this over that perfect picture of a weekend. As I started moving towards the edge, fear started rising. Finally, the point came where I could not see any land. The most difficult part of it was that first step off the edge of the cliff. I was in tears and had almost given up. How could possibly I take my foot off the land and suspend in the air hoping that the belt around my waist & the ropes attached to it, are enough to carry me all the way down safely? I wanted to run away, magically disapperate & apperate in my living room. I wanted to undo my choice. But it was too late. The only deterrent to turn back was memories of the trek up there. Climbing up there hadn't been that easy and the idea of going back by that route wasn't a rosy one. Once I let go of the visible ground and started hanging in mid air, it became a bit easier to carry on (probably because I knew that there is no turning back now). The only way was forward, or should I say down. 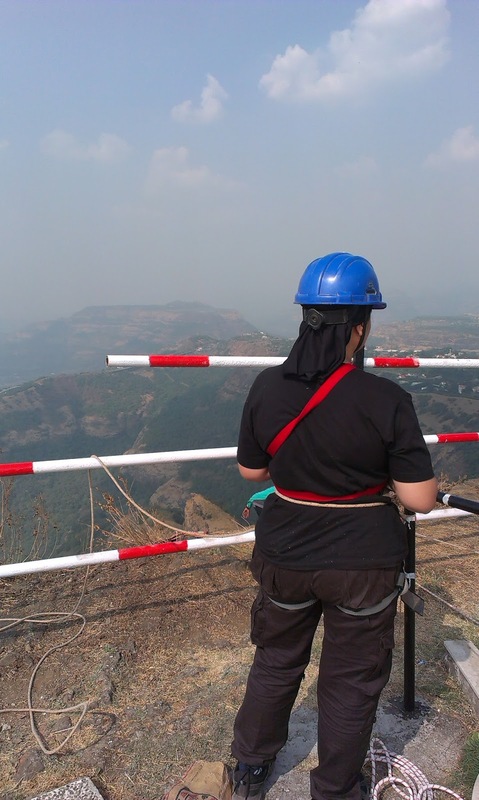 I had decided not to look at the valley at all, to keep myself from panicking mid air. "It is enough for a starter to be able to complete it this time. If I survive this, maybe next time I will look at the valley" I told myself. It is funny to observe what all thoughts cross your mind in such situation, when you are there hanging between life and death, with nobody to talk to but yourself. Sometimes, you have to let go, to be in control, 'Let go of fear, to be in control of yourself'. That day I understood the meaning of 'Leap of faith'. Here I was trusting strangers with my life and I knew that they were much more than worthy of it. A thought crossed my mind, what if I die today? But then another thought followed it 'We all have to die one day, what matters is how. People die in road accidents, train accidents, or for that matter even under collapsing buildings! You can not control when or how to die. But wouldn't it be better to die doing something you like, instead of in an accident? The idea is not to be afraid of death, but die without any regrets'. I could very much imagine two versions of myself presenting two completely opposite thoughts, one in an angel avatar & the other one as devil. I was realising that these activities are as much about your mind as they are about physical stamina & agility. The journey down there was hardly 10-15 minutes (to be honest I completely lost track of time while coming down). I was enjoying the silence only broken by sound of wind & occasional instructions from the volunteers. 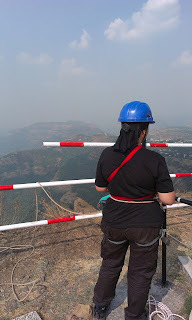 I had forgotten about the pain I took to get up there or even the pain which was waiting down there for me, was just living in that moment, enjoying every bit of it. I hardly got to enjoy that in busy city life, where the only mantra to survive is fast pace of life. 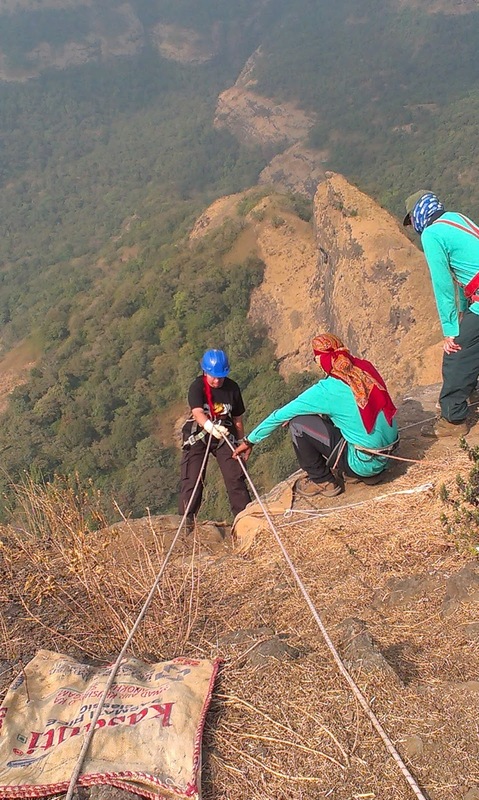 The volunteers were there to greet me at the bottom of the cliff, but the journey wasn't over. 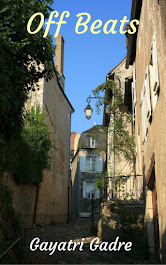 I had to cross some distance on a very steep path, with valley on one side & the cliff on the other. I found it too much after having been through the rappelling. But the thought that my lunch was waiting on the other end of that route helped me get through it. One thing was sure the person standing on the edge of cliff few minutes ago wasn't the same person who landed down. Something had changed in me. It was as if this experience had given me a new lesson of life, which was difficult to express in words, but it was etched somewhere in my subconsious mind forever. The sense of achievement which followed after getting back to base camp was huge. There may be hundreds of people doing it regularly, but it was definitely a big milestone for me as an individual. 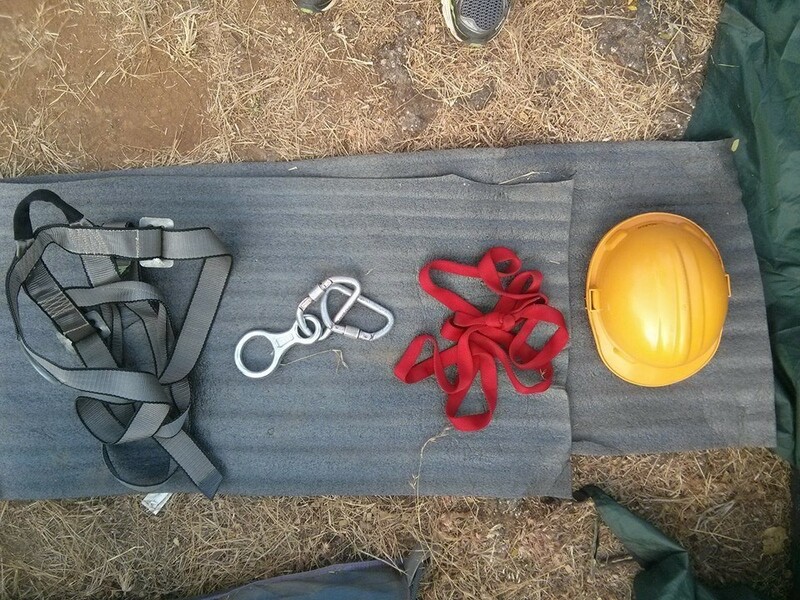 Now that it is over, if you ask me "Will you go for rappelling again", the answer will be "Hell yeah!". Okay, it won't be easy, I will be probably cursing myself for agreeing to do it again and may as well be in tears again, but it's all worth it. Weekends are not always about being cozy & comfy in your couch, wiping your tears while watching that mushy-mushy movie on 'Romedy now', they are much more than that. And for a change its ok to be in tears while fearing for your life than watching strangers in a movie and feeling their emotions. After all, those are their emotions, and they can't match with feeling your own emotions, ain't? 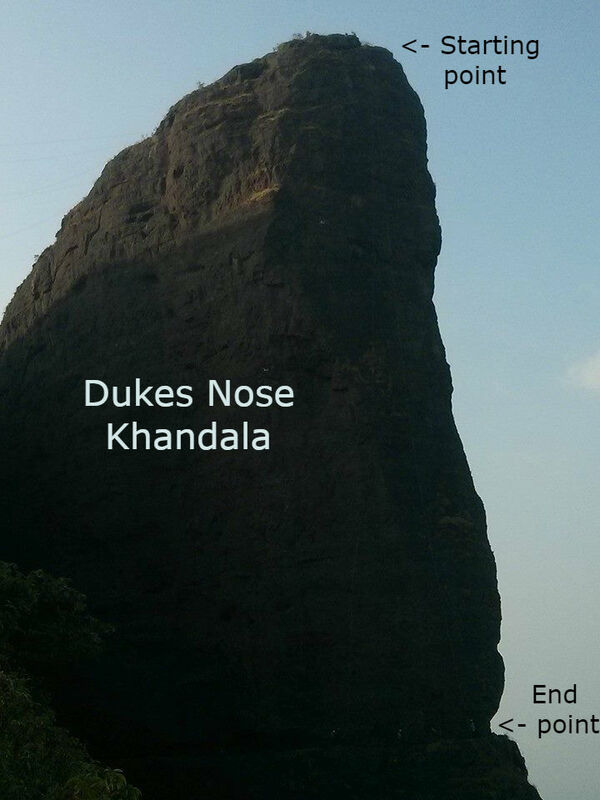 Here is a picture of Duke's nose we took from the base camp, before starting our trek up to the starting point. The distance we came down Rappeling, from the top till the curve at bottom with tiny people standing (people who helped me with the landing and tough part of crossing the rocky patch to come back to the base camp).